As we approach the winter months it can become harder and harder to get outside on the bike. Not only can the weather be a challenge, but it gets darker earlier so you may be out of daylight by the time you get home from work. All of these things can really hinder a training schedule. I’ve got additional challenges I face – as a week out of every three or four I have work duties that demand my laptop always be with me. Not only is it a hassle to carry it around while riding, getting stuck on the bike trail should I be called upon to actually use that laptop is not a happy proposition. What is a cyclist to do? 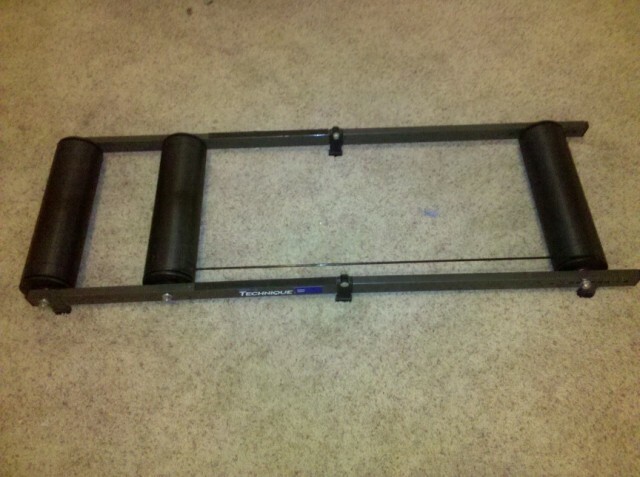 Well – my solution was to get a set of indoor rollers. This solution was partially enacted when I found a used set on Craig’s list. I think I paid the guy like $45 or something. Not only was there a full set of rollers, but there was also a fork stand so that I could hard-mount the bike and just have the back wheel spinning. Good thing too – the belt that is supposed to accompany a set of rollers had broken on the previous owner. After a couple of sessions bracketed into the fork stand, I began my search for the replacement belt. 6 bucks a about 7 days later, the belt was in place, the fork stand was removed and I was ready to give the rollers a “whirl” for real. So rollers are a little tricky to get used to to say the least. I put about 20 minutes into that first session, and never managed to do much more than one hand on the safety grip, on hand on the handlebars, and a lot of starts and stops trying to keep in a straight line. I’d read that riding rollers is not only good for basic strength/endurance workouts, but also greatly improves your bike handling skills as well. Yea – I can see why. After that first attempt, I moved the rollers into the door frame for my second attempt. This is definitely the way to go. What worked best for me was to position it so that my elbows were right where the door jam was. This way, with both hands on the handle bars, I could gently stick out my elbow and put a little pressure against the door frame if I started to fall one way or the other. The other thing I found was – just like on the road – for some reason looking down at the front wheel as it is spinning is not a good strategy for maintaining your straight line. In fact, when I looked across the room at the TV and didn’t target my every thought on keeping my bike straight on the rollers, I actually found I could do it a lot easier. It really is like riding on the road if you don’t get all hung up about it. Only thing is, you’ve got to stay within about a 3 foot space (depending on the size of your rollers) or you’ll be in a world of hurt. I thought a little bit about the nightmare scenario – namely falling off the rollers, hitting the floor at full speed and shooting across the living room. However, in practice I found that if anything the front tire falling off seemed the most likely scenario. And, if the front tire were to fall off but the back tire were still on there really is no forward momentum as far as the floor is concerned. I don’t think the physics will allow the cartoon-inspired “hit the ground and ride straight through the opposite wall” possibility. So currently I’ve got at most 20 miles on the rollers. Not a lot of miles for sure, and I’m definitely no pro, but the clumsy feeling is starting to go away. I imagine sometime within the next 100 miles done indoors it will become less painful that going out in the pouring rain. Well, ok, the riding in the rain isn’t really all that painful. But I absolutely hate needing to clean up the damn leaves and road gunk from my down tube … while it is still raining.